May I introduce you to a marvelous, magical creature? 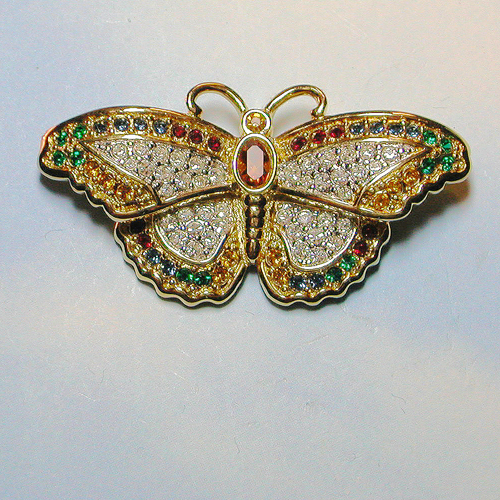 This beautiful butterfly is dressed in red and green pave rhinestones, features sparkling topaz stones at its head and body and is set in a beautiful gold tone. It is dimensional in design, measures about 1" in length, 2" across and is in mint condition. The SWAROVSKI swan logo is stamped on the back of the butterfly's head. As with all SWAROVSKI items, this is a quality brooch with substance that is timeless in look and design. Now that you've met, would you like to invite it home?